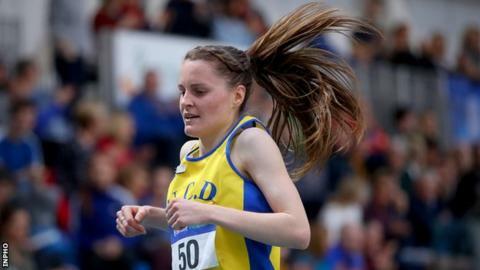 Ciara Mageean maintained her impressive run of form as she clinched a dominant 3,000m victory at the Irish Indoor Championships in Dublin. Mageean, 26, had nearly 12 seconds to spare from Olympic steeplechaser Michelle Finn as she took the title in nine minutes and 2.57 seconds. The Portaferry athlete's time is also a qualifying mark for next month's European Indoor Championships. Mageean improved her own Irish Indoor 1500m record in Athlone on Wednesday. That time of 4:06.76 was also way inside the Glasgow 1500m standard and she will be concentrating on the shorter event in Scotland. Mageean set her 3,000m personal best of 8:55.09 indoors in 2015. Finn was second in 9:14.13 with junior talent Sarah Healy [9:24.48] taking the bronze over nine seconds ahead of another Olympic steeplechaser Sara Treacy. Irish stars Thomas Barr, Leon Reid and Phil Healy all came safely through heats in Saturday's action with Sunday the main day of competitive action at Abbotstown. Barr and Healy won their 400m heats with Reid victorious in his 60m and 200m qualifiers. Finn Valley's world junior silver medallist Sommer Lecky was among Saturday's gold medallists. The Castlederg youngster jumped 1.86m after being given a strong test by Sli Cualann's Philippa Rogan who scaled 1.83m. West Waterford talent Kate Veale clinched her expected 3,000m walk victory in 13:18.39 while another Irish international Alex Wright won the men's 5,000m walk in 18:53.87.